WE should expect this from a “700 Club” (CBN) website. The statement by Rhodes is frivolous and unsubstantiated. To suggest the printer “ran out of pilcrows” reveals parroting what he read by others as well as a lack of knowledge regarding the importance of printing for the Crown in 1611. THERE actually are several who suggest the printer ran out of the pilcrow type at this point–if he did, it was an ordained lack. However, considering the extensive use of the mark throughout the OT and the Gospels, as well as the meticulous care in typesetting, etc.-under the King’s orders and the scrutiny of the translators—-it seems to me that idea of running out of type is silly. Unfortunately (?) we have very little of the KJB translators’ notes to see their reaction. There are no records of objections by others at the time. The “last paragraph mark” was noted without a known reason several years later and since has been a mystery—but the pilcrow absence survived all the reprints. Why? LIKE other unusual features in the KJB such as the sixth book in the NT (R-O-M-A-N-S six letters with MAN in it) that means “according, or having to do with man”, there are exactly 6 verses where the 6th word in each verse is “man” with the last being Romans 6:6, the missing pilcrows actually defy normal explanation. A question regarding the last paragraph in the KJB was asked by a Bible believing pastor. Here is my answer to this mystery: another one of the many “coincidental” features of the KJB. FIRST: As used in English, the pilcrow was not at a mere paragraph marker but also a MARK OF ORDER OF EVENTS, for example, in a service in which certain people were to perform an action or a particular change was made in events. It was also used to mark off discourse changes. Today’s usage is extensive in legal writing to mark off various parts and it is still used by many in formal writing. THE personal and direct statement by Paul is made to the Ephesian church in vss. 28-35. This final pilcrow is NOT just the last paragraph of Acts, it is the final one in the Bible. Most miss that the final paragraph begins in v 36 and has not yet ended! Of course the argument could be made that the next chapter automatically begins a new paragraph but the fact remains there are no more pilcrows in the Bible. I believe the pilcrow at v 36 is connected with the prison epistle truth found in Ephesians-Philemon. The charge by Paul to the Ephesian church is in the same structure as his letters: doctrinal content is first and the practical applications are at the end of his charge. IF my observation is accurate, then what we have is a significant change noted here from Paul’s Acts ministry which purpose was to gather out a remnant of Israel (… to the Jew first… Romans 1:16) by grace into the Body of Christ (Romans-Galatians: Acts epistles) to his prison ministry that goes without distinction to all men without any advantages to anybody (Ephesians-Philemon. See Philippians 3 ). CONFUSION among believers today is the result of failure to rightly divide the word of truth (2 Timothy 2:15) and acknowledge that Acts is not the final book of doctrine for this age: Acts is a book of transition from the Twelve Apostles led by Peter, to the Apostle Paul: a change of message from man’s faith that works, to the faith of Jesus Christ that finished the work: a change from the gospel of the Kingdom to the gospel of Grace: a change from Jew only, to Gentiles also, to all men every where without distinction. THAT is a PRISON epistle written by the same man who gave the circumcision an advantage over a Gentile in Acts who now says that any ministry which gives an advantage to one flesh over another is a ministry of DUNG. It was right to go “to the Jew first” in Acts but it is a ministry of DUNG now. 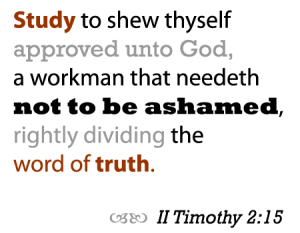 Those who fail to listen to Paul (2 Timothy 2:7) or use their Bible like a smorgasbord buffet will have to ignore, spiritualize, or explain away why they DO NOT AND CAN NOT OBEY ALL of the examples of the Apostles’ practice in the book of Acts. NOT one person goes to the Jew first with signs to prove their ministry today as it is done in Acts, and NO ONE FOLLOWS the doctrine and practice of the “early church” in Acts 1-10. Those who claim they do are liars, spiritualizers, or certified nuts. A Jew can be saved today but he is saved just like every other person is saved. The NATION is without an advantage, has no prophet, no special revelation. Israel will be blessed only AFTER the final 70th week (7 years) of Daniel’s prophecy. After the Body of Christ is caught up to meet the Lord in the air, that final 70th week begins. At the end of it Israel will repent and call upon the Lord, “Blessed is he that cometh in the name of the Lord”. It is then, and only then the Lord will bless Israel again and set up His earthly Kingdom in Jerusalem for 1000 years of peace on earth. The last paragraph mark in Acts does not stand as a simple omission by a printer but is a Divinely imposed mark to give the Bible believer another affirmation of its miraculous content.